Vacuum Breaker Relief Valve 1/2"
UT 30 30 Gallons Diameter: 16" Height: 45"
UT 40 40 Gallons Diameter: 16" Height: 58"
UT 40* 40 Gallons Diameter: 16" Height: 58"
UT 80 80 Gallons Diameter: 21" Height: 63"
UT 120 120 Gallons Diameter: 24" Height: 74"
UT 200 200 Gallons Diameter: 30" Height: 79"
UT 270 270 Gallons Diameter: 36" Height: 81"
Tank Contact Mixing 30 Gallon 1-1/4 inch inlet. The CT-30 tank is a durable easy-to-install retention tank designed to provide optimum contact time during chemical treatment. These lightweight seamless totally non-corrosive retention tanks are ideal for new and replacement installation where durability is at a premium. Seamless one-piece inner shell of NSF listed polyethylene. No vulnerable interior tank coating. 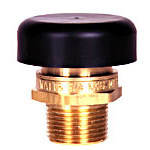 75 psig Maximum operating pressure. 1-1/4in. socket connections top and bottom.